Hey Everybody! I am back with my second blog hop of the day and this time around I am hopping with the A Paper Pumpkin Thing crew. This is a huge hop full of fantastic artists and all of us are bringing you alternative Paper Pumpkin card and project ideas. This month's kit is called Wildflower Wishes and it is gorgeous! For my card I decided to go for a grungy, shabby chic look. I embossed the sticker letters in Copper Embossing Powder and stuck them onto a piece of vellum. The background is watercolor paper stamped with Sahara Sand. I roughed up the edges of the watercolor paper with my finger nail and made sure there were a couple of tears in it. I also roughed up the edges of the DSP mat in the background. It might be a little hard to see, but after distressing the edges of the cardstock, I used my aqua painter and some Melon Mambo ink to add a little color to the edges of the paper. I wanted to add a bit more color but I really wanted it to be muted. Something I did that you cannot see at all in the photos but does make a difference to the naked eye... I sponged white craft ink onto the edges of the DSP piece. It toned it down just a little and gave the card a softer look. The twine and the floral background piece both came in the kit as well. I colored in some small clear enamel dots with my Blends and added those for a bit more color. For my project I decided to make a tag. I love all of these bright wildflower pieces that came in this kit and I wanted to pair one with a color that would make the flowers pop. I think Night of Navy does that nicely. The sentiment is stamped in Old Olive and the "so much" is stamped in Sahara Sand on watercolor paper and is watercolor washed with Daffodil Delight. I added Sparkle, bling and some twine to finish my tag off. That's it for me today. 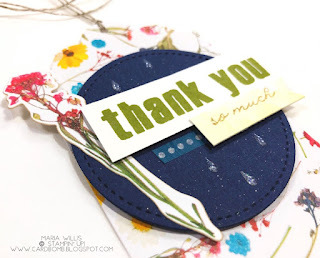 Thanks so much for stopping by my blog and I hope to find you back here soon! Now prepare to be wowed by the fabulous Jennifer Hill! 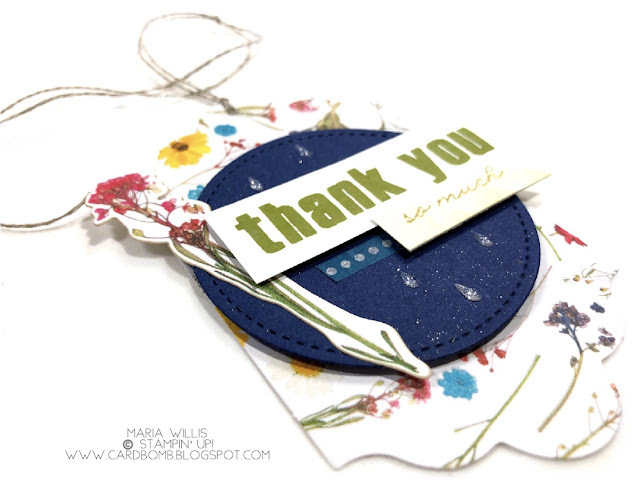 Love your altered projects, Maria!! Bea-uuuu-tiful! Thank you Tricia! I'm so glad you liked them! 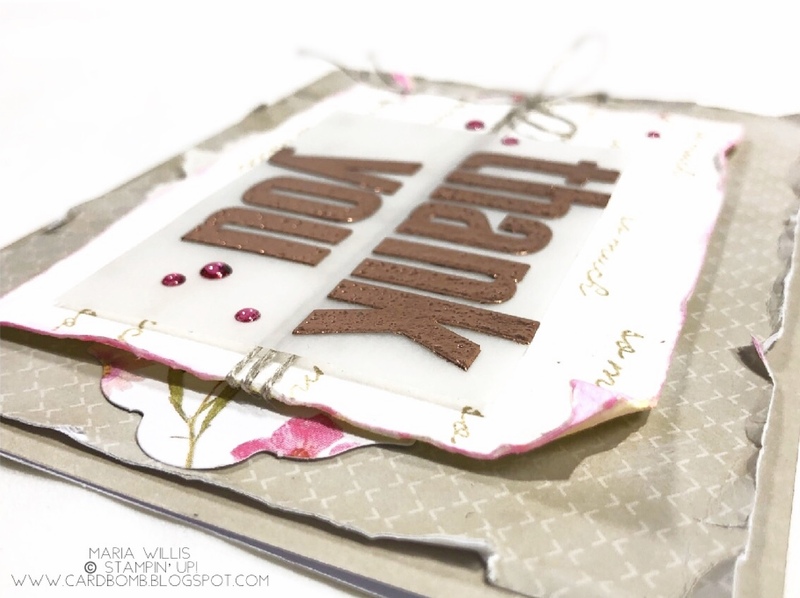 Those pieces are perfect for tags and I love the idea of embossing the letters! 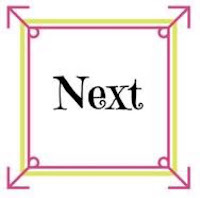 Your card and tag are beautiful! I love that you added touches of Melon Mambo along the edges of your distressed piece -- it make everything come alive! Thanks Sara! It just needed a little something extra and I was so glad that the Melon Mambo on the edges did the trick! Great alternative projects, Maria! Thanks for sharing.